Chevron Edge has all the easy-to-use, versatile appeal of Simple Edge but with an added zigzag border to jazz up the look. Beautifully varied hues of color on a soft woven texture set the stage for your images and text. Most shapes in this style feature a prominent space for your own uploaded photos or artwork. With over twenty background colors and eleven fonts to choose from, you're sure to find one that makes your image and words look fabulous. Personalizing your labels, tags, coasters, invitations and more is a breeze with Chevron Edge. Customize your Chevron Edge bar/bat mitzvah tags for your bar mitzvah or bat mitzvah today. Chevron Edge Bar Mitzvah tags are printed on one side and are blank white on the back. You have the option to add text on the back for a small charge—just ask! 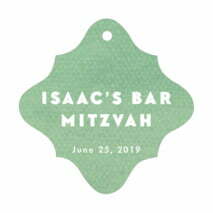 Bar Mitzvah tags are printed on extra-thick cover weight white paper and come in a variety of shapes and sizes, including square, circle, heart, a scallop-edged circle, ovals, and other shapes. 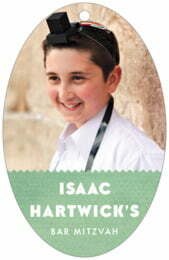 Bar Mitzvah tags come pre-punched with a small round hole to thread your choice of tying material. They are punched out individually and packaged as a set in small bags. Select the green "Personalize" button to begin customizing your Chevron Edge Bar Mitzvah tags today!